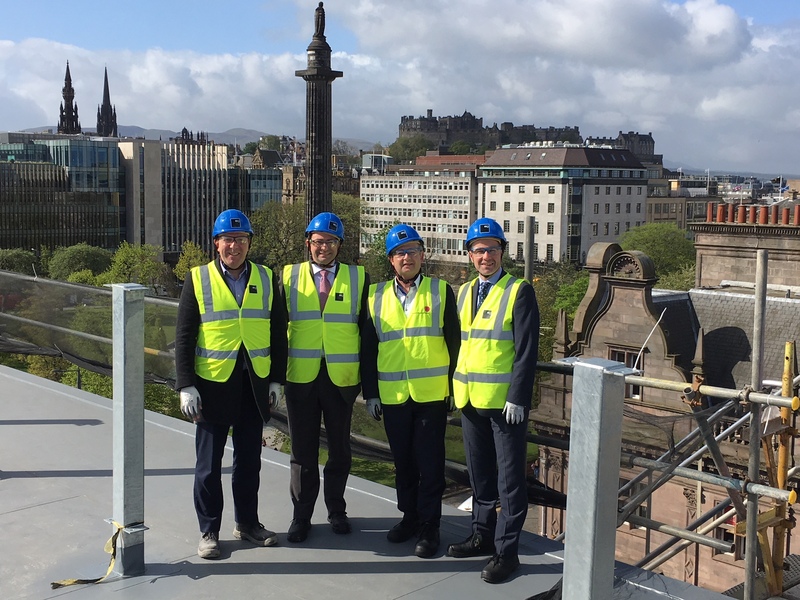 Knight Property Group Directors, along with representatives from Computershare gathered on top of 4North (to be renamed Edinburgh House again following occupation by Computershare) to celebrate constructing the buildings highest point of 24.4m. 4North is a grade A city centre office redevelopment by Knight Property Group offering 41,140ft2 of office space on the north side of St Andrew Square in the heart of Edinburgh City. The building will benefit from many modern new features and an additional penthouse style floor with stunning 360 degree views across Edinburgh and the Forth. Comprising 8 levels of offices throughout, 12 car parking spaces and reception amenities – completion is expected towards the end of 2018. Managing Director of Knight Property group, James Barrack commented: “4North is a modern and contemporary redevelopment of what was a tired property, located in a prime location which has seen and continues to see an influx of new leisure facilities and the redevelopment of surrounding buildings. We saw great potential in the building due to its location, quality and diversity of surrounding occupiers. We knew this would make a fantastic redevelopment for a company such as Computershare. Upon completion, the property will sit well within our portfolio and I would like to thank all those involved who helped broker the deal and who are currently involved in the construction on site. Cameron Stott, Director at JLL said: “4North is Knight Property Group’s current landmark Edinburgh development, it is one of Edinburgh’s largest and highest profile commercial developments and the topping out ceremony is a huge achievement to celebrate. The development has seen a team of over 100 construction workers working over a 60 week period to deliver this challenging development in a busy city centre location. The success of this investment, redevelopment and design of the build is reiterated through the pre let to global financial services company, Computershare, as their new Scottish headquarters. 4North sees more success having won Deal of the Year at the 2018 Scottish Property Awards in Glasgow on Thursday 3rd May and Knight Property Group continues to grow their portfolio out with the North East of Scotland, having invested in excess of £25 million within the central belt over the last 3 years.